Microwaves have for decades attracted all sorts of myths regarding their safety. Some common ones include the beliefs that they give you cancer, that they cause food to become radioactive and that they kill nutrients. Microwaves are largely safe kitchen appliances. They won’t radiate your food nor will they cause cancer to anyone standing around it. As for nutrients, all forms of cooking destroy some food nutrients. In fact, using a microwave oven preserves more nutrients than other cooking methods. But that doesn’t mean they cannot be safety hazards. Most of the safety risks associated with microwave ovens are as a result of improper use and worn out components. So why is a microwave dangerous? Here are situations where the humble microwave can become dangerous. Burns are by far the biggest safety risk associated with microwave ovens. There are numerous cases of people getting burnt not by radiation but the hot food or fluids they are cooking or warming up. When using a microwave it’s easy to forget how hot the food can actually get. This is perhaps because the container feels cool the touch at first. While microwave-safe containers do not absorb microwaves (hence they are not heated directly), they can still get hot from the food or fluids in them. So whether it’s a cup of tea or a plate of leftovers, handle it with care. If it’s hot water, you need to be even more careful. Because there is nowhere for steam to escape in the microwave, the water could get superheated beyond the usual boiling point but without boiling. Then when you go to take it out, it erupts as all the pressure escapes. This could cause serious injury. The common advice from manufacturers is to let hot fluids, especially water, rest for a couple of minutes before you take them out. 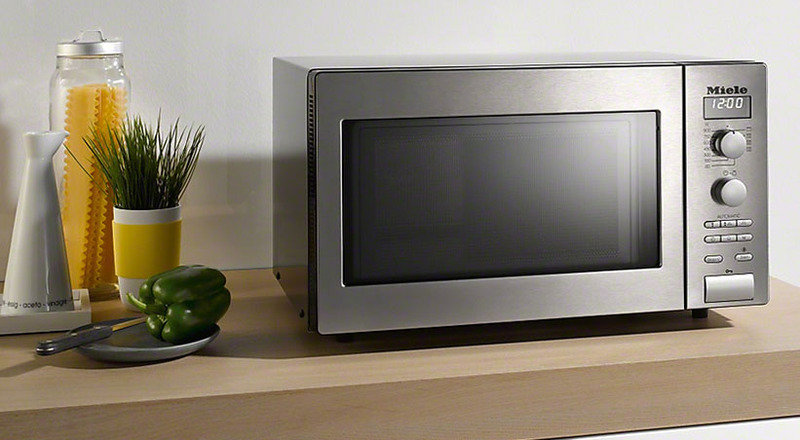 Microwaves are designed to contain as much radiation inside as possible. But some of the microwaves will leak out. This is normal and the leaked radiation is far below the recommended minimum exposure levels. But if you have a defective microwave, the leak could be worse. In extreme cases the leaked microwaves can cause a burn on your skin. Check that your microwave’s door is closing properly. If your microwave seems to be working even with the door open (it shouldn’t work until it senses the door is closed), stop using it and have a professional look at it. Same goes if it has cracks or any other defect. In other words, never use a damaged microwave oven. In your microwave’s manual, one of the warnings is to avoid putting any metal materials in your microwave. Metal in a microwave will not explode. But it’s still dangerous. In most cases you’ll just see sparks and arcing. But if you leave in the metal for too long it could cause a fire or serious damage to your appliance. Here’s a quick video clearly explaining what happens when you put metal in the microwave. A bit of foil is okay. Some manuals will even recommend using foil to protect tender parts of meats when thawing. But do not purposefully put any metal in the microwave. On the same note, only use microwave safe materials. Certain plastics and cling wrap can melt in the microwave if it is in contact with food. This is especially the case if you are heating or cooking fatty food like sausages or meat. This is not so much a danger to you or the microwave as it is a waste of food. To prevent it, poke foods like sausages, potatoes and squash with holes using a fork before popping them into the microwave. Do not hard-boil eggs in the microwave. Finally, something most people don’t think about. One advantage of a microwave is that it heats foods faster and more evenly. But even it will struggle with thick foods. The microwaves do not penetrate properly and the centre may remain untouched. This could expose you to dangerous microorganisms. If you are cooking or warming thick food, select a lower power level and increase the time. Alternatively, let the food rest after microwaving to allow the heat to spread fully inside.